Bangkok Airways Public Company Limited led by Capt. AM.Dechit Chareonwong, Vice President – Flight Operations (6th from Left), Mr.Nijjapat Piyapant Vice President – Ground Operations (4thfrom Right), Mr.Tongsook Chompoonuch, Vice President – Maintenance (5th from Left) and Mr. Peter Wiesner, Advisor – Network Management (4th from Left) welcomed airline’ pilots and the latest Airbus A319 at Suvarnabhumi Airport. 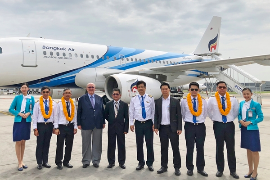 This Airbus 319 accommodates 144 passengers in one class configuration and will be serving both domestic and international routes such as Chiang Mai, Phuket, Samui, Krabi, Myanmar (Yangon and Mandalay), Cambodia (Siem Reap and Phnom Penh) and India (Mumbai).